President Donald Trump and his Republican-controlled Congress are getting ready to kill off our public “Dodd-Frank” protections passed after the financial crash, including killing or maiming the Consumer Financial Protection Bureau (CFPB). Our lawmakers need to hear from us so they can know how we feel about that. So the #ResistTrumpTuesdays movement is urging them to “Make a Date” to hold town hall meetings with their constituents. The next congressional recess will run from February 18-26. Senators and representatives typically use that time away from Washington, D.C. to hold local “town hall” meetings with their constituents. But this year, many Republicans will be dodging this responsibility because they don’t want to hear what We the People have to say about what they have been up to in the last few weeks — and they don’t want to hear what we have to say about they have been doing and planning. 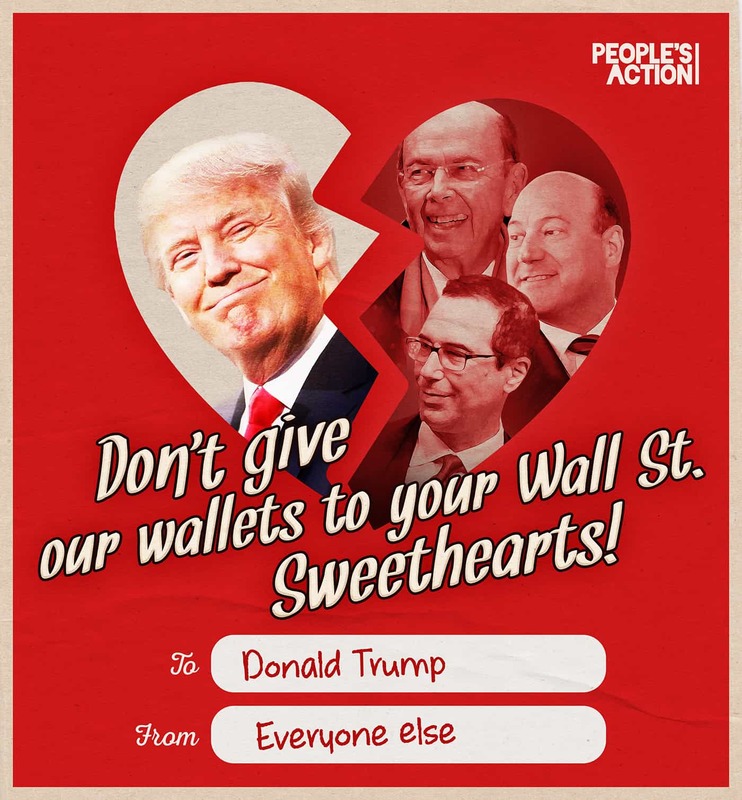 This Valentine’s Day you can congratulate Trump and the Republican Party on their deep romance with Wall Street. Show up at this week’s #ResistTrumpTuesdays to demand that your senators and representative hold an open, public town hall meeting so their constituents can express how we feel about seeing our consumer protections, health care, and more on the chopping block. ● Scams that promise to help consumers get out of debt, then do nothing after collecting up-front fees. The CFPB also forces companies to disclose how much it costs to send money overseas. It is the CFPB that caught Wells Fargo opening millions of fraudulent accounts. The CFPB recovered the lost funds for account holders and fined Wells Fargo $100 million. Scams like these have brought in millions, even billions of dollars to the financial industry over the years. All these protections are why the financial industry — coupled with their bedmates in the Trump administration and the Republicans in Congress — want to kill off or neuter this important agency. For example, consider the prepaid debit card scam. Million of people across the nation are “unbanked” or “underbanked,” which means they do not have bank accounts or don’t have enough money to use them effectively. Because of this many of them purchase prepaid debit cards. This is a huge scam for the financial sector, adding up to over $100 billion last year. But the cards have tremendous “fees” attached, eating up the balance, and then if the balance drops below zero many of them turn into scams similar to “payday lender” debt traps. Beginning in October 2017, packages containing prepaid debit cards — which are typically sold in convenience stores and other establishments — will be required to carry a standardized disclosure of the card’s monthly fee. They will also have to detail charges for cash withdrawals, customer service calls, reloading the card and other activities. Such fees, which average around $11 a month and can swallow most of the card’s initial value, have been termed predatory by consumer watchdogs. The new rules, announced early Wednesday by the Consumer Financial Protection Bureau, are meant to shed light on a product that is often the subject of complaints. In late 2014, the agency released a draft of the rules. The final version, released this week, covers a broad swath of products, including government cards used for Social Security payments and other benefits, payroll cards and funds stored in mobile apps like PayPal and Google Wallet. The CFPB is imposing new rules of these predatory debit card companies, including fee disclosures and limits on overdraft fees. Companies will also have to offer limits on liability for stolen cards, just like they do with credit cards. It took four years to get these rules ready and they will go into effect in October. To avoid the predatory debt trap, companies will have to evaluate customers’ ability to pay off loans before they are issued and to wait 30 days before offering them. A group of seven Senate Republicans are moving to gut consumer protections for prepaid debit cards before they’re enacted. The rules, aimed at providing many of the same safeguards that consumers take for granted with credit and debit cards, would require fee disclosures, fraud protections and limits on overdraft fees. Wall Street (the financial/insurance/real estate/banking industry) doesn’t want government cutting into their ability to impose fees on consumer products like debit cards (the fees fueling a significant share of their profits) and they see the spread of debit cards for government payments as a critical line of business. So they have their pet Republicans in government working to get this done. What can you do about this? For starters, you can join the #ResistTrumpTuesdays movement. Click here to enter your zip code to find an event near you. On Valentine’s Day ask your senators and representative to “Make a Date” to have public town hall meetings.